Oscillating tools are handy in the shop or on the job, and the best oscillating tool is designed to fill a variety of applications. Look for tools which are manufactured by leaders in power tool construction, so you’ll know you’re getting a product designed for heavy use and durability. And since you’ll most likely find a lot more jobs for the tool than you’re currently thinking, pick up a kit that includes the most popular pads and tools. To help those who are working on-the-go, we round out our selections with a powerful cordless model that will get the job done anywhere. Whether you’re finishing furniture, woodworking, or polishing, one of these top oscillating tool picks will be a good fit. 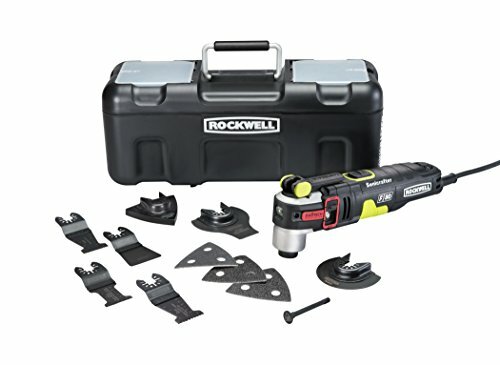 Owned and manufactured by the Positec Tool Corporation, Rockwell makes one of the best oscillating tool kits on the market. Featuring Rockwell’s patented Hyper Lock and Universal Fit Systems, the Rockwell RK5151K 12-piece set provides smooth use without slippage and the ability to use tools and accessories manufactured by other tool makers. Driven by a powerful 4.2 amp motor, this tool is designed to work faster and harder, and is an improvement over the popular F50’s 4 amps. The kit comes with 10 “usable” accessories so you can go straight to work. The F80 is also the first tool to feature a choice of two cutting angles in one tool (3.4 and 5.0 degrees) to better match your project’s needs. The Universal Fit System is also great in that you’ll be allowed to use blades you may have laying around from different manufacturers. And to increase your productivity, you can apply up to 35 pounds of force, reducing most cutting times dramatically. The variable speed dial allows you to adjust speed from 10,000-19,000 oscillations per minute for greater control. You’ll appreciate the tool-less changing system that provides a full 1 ton of clamping power. The manual that is included with the kit is poorly written in English, so you may have to rely on your ability to decipher pictographs or spend a few minutes on YouTube in order to learn the basics. But if you have any previous oscillating tool experience you should not have any trouble jumping in and going to work. Other than that, the only complaints are from those who are surprised to find out that this trusted brand is manufactured overseas, and not related to the tool at all. Fortunately, this is one of those imported products which actually works very well. A subsidiary of Stanley Black & Decker, USA based Porter Cable tools are now made in China but have excellent tool quality for the price. The company is recognized as the inventor of the portable belt sander as well as portable band saw so they know a thing or two about high performance in a small package. The PCE605K52 features a tool-less changing and adjustment system, and the kit comes with almost twice as many accessories as the Rockwell version (the entire kit totals 53 pieces). It also has a 10 ft cord that lets you move about while you work without that annoying tug– or worse, power failure– when you reach the end of the cord. The oscillating speed dial allows you to slow the speed to as little as 10,000 rpm, or maximum speeds up to 22,000 rpm. The single biggest complaint you might encounter is that the replacement blades and pads are proprietary and cost a bit more for that reason. On the other hand, you can pick up generic and aftermarket accessories at competitive prices. For long periods of use, you are well-advised to take periodic breaks and allow the motor to cool down. You will feel the housing getting warm when the motor is getting too hot. Another tool company owned by the Stanley Black & Decker Corporation is DeWalt, one of the most well-known manufacturers of corded and cordless tools. DeWalt has applied their cordless technology to a portable oscillating tool that delivers 2 amps of sanding and cutting power. The kit does not include a big variety of accessories, but it includes a quick charger for the 20 volt lithium-ion battery and a hard plastic case to protect your investment and it comes with an adapter so you can use most popular brands of accessories. Built jobsite tough and packing the battery technology acquired through years of research, it is hard to go wrong with the Dewalt DCS355D1, unless you forget to pick up a spare battery to double your use time. The motor may not kick as high an rpm as the corded models, but it more than makes up for that loss by incorporating a brushless motor that can give as much as 57% more use in the field. If you need the portability or already have other 20V DeWalt tools you can switch batteries with, the DCS355D1 is the best cordless oscillating tool for the money. Love my F50… the best tool for the money. Thinking about getting another for my shop. What do you think about the F80? I like how you can choose between a couple different angles.